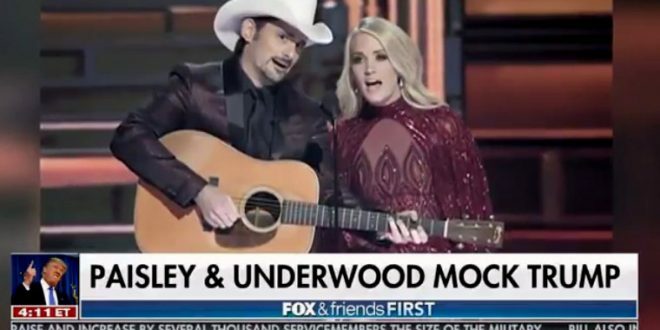 Country Music Awards Hosts Mock Trump [VIDEO] - Joe.My.God. Brad Paisley and Carrie Underwood, hosts of the Country Music Association Awards, flouted the whims of CMA producers with a political opening song poking fun at President Donald Trump. But then, Paisley said screw it, and launched into a rendition of Underwood’s 2005 hit “Before He Cheats,” but with a few alterations to fit the song to the current president.